The snowcapped summit of Everest, world’s highest peak at 29,035’, looms over the Khumbu region of Nepal. Beneath the icy faces of Everest and its neighboring giants, Nuptse and Lhotse, the Khumbu welcomes the foreign trekker with its Sherpa hospitality. The beauty of the Khumbu’s soaring peaks and green valleys led to the establishment of the first national park in the Himalaya: Sagarmatha National Park, after Everest’s Nepali name. Besides Mountain panoramas of Everest, Ama Dablam, Kantega and Thamserku, we experience the rich Sherpa culture. The route begins at Lukla, where we land on a runway surrounded by 20,000’ peaks. From there we ascend the river valley to Kala Patthar (18,200’), visiting Namche Bazaar, Khumjung and Pangboche monasteries, and other villages along the way. At the head of the valley, Kala Patthar provides unobstructed views of the south and west faces of Everest. We then venture past the Khumbu Glacier’s tall ice seracs to enter the famed Everest Base Camp. 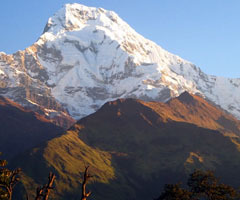 Participants in this trek should be in good physical condition, as we hike at elevations of up to 18,200’. Along the route, we’ll take breaks and meet the locals in tea houses, villages, Buddhist monasteries and marketplaces. Day 01 Arrival in Kathmandu meet and transfer to our hotel. Day 2 We enjoy a full day in Kathmandu. In the morning, we take a guided sightseeing tour of the Hindu site of Pashupatinath and the Buddhist site of baudhanath. The afternoon is open for final trek preparations and a little exploring. We may visit the city center at Durbar Square and enjoy the shops, restaurants and evening street life in the lively Thamel Area. Day 3 We fly to Lukla (9,186’) and begin the trek. This initial section follows the Dudh Koshi River Valley through a relatively rich agricultural area. The Sherpas in these villages raise large crops of corn, potatoes, wheat, turnips, cauliflower, and cabbage, and tend herds of cows, sheep, Goats, and yak cross-breeds. Interspersed between villages stand magnificent forests of magnolia, rhododendron and fir trees. As we hike, watch the cliffs above the river for a glimpse of musk deer and Himalayan tahr. We’ll visit the gompa (monastery) at Phakding, largest in the Pharak district and spend the night in the village at 8,300’. At Jorsale the trail enters Sagarmatha National Park, established in 1976 with the support of the New Zealand government. The remaining stretch to Namche Bazaar (11,286’) is steep. A prosperous market and administrative center for the Khumbu Region, Namche is the largest townin the area. Day 5 After yesterday’s challenging hike, we spend a day exploring Namche. This allows us time to rest and acclimatize. Day 6 We hike to Khumjung (12,434’). This village, more traditional in appearance than Namche, is the location of the Hillary School, a primary and secondary school financed by the Himalayan Trust, the philanthropic organization established by Sir Edmund Hillary. We visit the village monastery, where relics of the yeti (the Abominable Snowman) may be viewed for a donation. Day 7 We enjoy a morning hike up the Imja Khola Valley to Phortse (12,500¢), an impressively perched village that dominates the entrance to the valley. Day 8 Continuing higher up the valley, we arrive at the summer settlement of Pheriche. Located here are the summer pastures and fields of Sherpas who live lower in the valley, grazing their yaks and growing barley here in the warmer months. The setting is one of alpine meadows and splendid mountain vistas. Day 9 Today we rest and acclimatize in Pheriche (13,920¢). Taking a day hike or ascending a smaller peak or ridge nearby passes the time and helps us adjust to the elevation. We follow the time-tested adage: Trek high, sleep low. Day 10 We ascend the wide valley to Phalang Karpo (14,240¢). The trail climbs steeply onto the terminal moraine of the Khumbu Glacier, and then descends to Duglha (15,158¢). We pass a cluster of monuments to climbers and Sherpas who have perished in mountaineering accidents, and arrive at the summer village of Loboche (16,207¢). Sir George Everest, who was head of the Survey of India from 1823-1843. We return to Loboche for the night. Day 12 We trek into the famed Everest Base Camp. Our route takes us along the Khumbu Glacier and moraine, and past seracs, tall ice towers found on glaciers of the Himalayas. Day 13 We return down the valley to Pheriche. Day 14 We walk through a beautiful rhododendron forest to the monastery of Thyangboche (12,700¢). Destroyed by a fire in 1989, this gompa is currently under reconstruction. At Thyangboche the mountain panorama is one of the most breathtaking in the Khumbu. From this vantage point, the massive Nuptse-Lhotse Wall conceals all but the tip of Everest. Rising above the monastery is “Mother’s Charm Box,” Ama Dablam (22,494¢). The name stems from a mountain formation said to resemble a dablam, a charm box worn by female residents of the Khumbu and Tibet. Days 15-16 We return to Namche and follow the rushing Dudh Koshi River through lovely forest, past mani stones and water-driven prayer wheels back to Lukla. 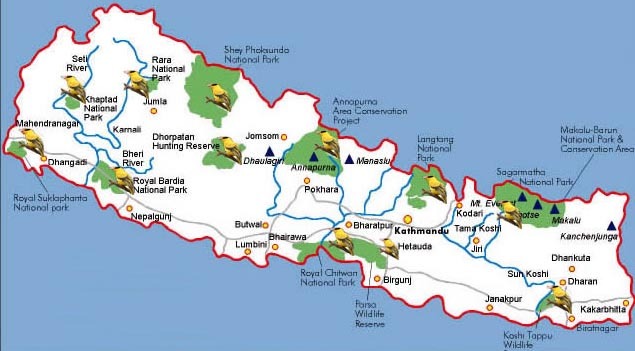 Days 17-18 We fly from Lukla to Kathmandu. The extra day serves as a cushion in case flight departure from Lukla is delayed. If the flight operates on time, we have an extra day in Kathmandu. Day 19 We depart from Kathmandu Namaste flight to your home.